West Sioux will be making their first ever trip to the state dual tournament. They will open against a team that has made the most appearances (23) of any other team in Iowa High School Wrestling. 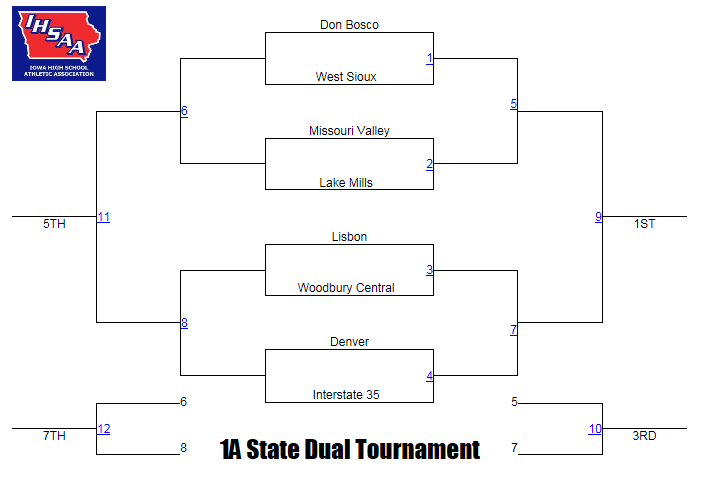 We should have a handful of decent matches though, since Don Bosco is solid to good at all 5 weights West Sioux has a state qualifier (113, 120, 145, 170, 285) This should be one of the only two front side of the bracket meets where the final result isnt too much in doubt, but West Sioux will undoubtedly put up some points. This meet will be a clash of two very different teams. Missouri Valley has half a team of ranked studs, but they drop off a bit after those top guys. Then you have Lake Mills who only has three ranked wrestlers, but is solid just about everywhere else. We have the potential to have bonus at almost every weight with Lake Mills being tougher down low and Missouri Valley being tougher in the top half. Denver has been one of the best teams in class 1A all year. They are also the only team in 1A to have a win over Don Bosco this season. A key injury early in the season to the Cyclones 126-pound wrestler Blake Steege was a huge blow to the team. There have been rumblings of Steege being back for State Duals, which could be a huge boost to Denver’s title chances. Will his knee really be healthy enough to give it a go, or will he just be used as a decoy? This is the question that will be on 1A coaches minds. Don’t sleep on this first round match up though. Interstate 35 is a team filled with wrestlers who could be ranked in the 10-15 range since most of them have wins over top 10 wrestlers sprinkled in with a few head scratching losses. This should be one of the other meets that shouldnt be too much in doubt in class 1A. Woodbury is another team that has a handful of top talent, then drops off a bit in some of the other weights. The Wildcats are coming in on a roll having qualified six wrestlers for the state tournament though. The only problem is that Lisbon is a very bad match up for Woodbury. Lisbon has a higher ranked wrestler at three of the four weights Woodbury has a ranked competitor at. Bosco will have a solid test in the semis with Missouri Valley. If nobody bumps around we could have three match ups between state qualifiers (138, 152, 170). Missouri Valley will need to rack up the points in the upper weights where the meat of their lineup is at. The only problem is the Dons should be able to minimize the damage up top since they have some tough kids up there as well. The difference will likely be Don Bosco’s ability to get bonus points in the lower five weights. You aren’t going to want to miss this one, folks. These two teams have not met in a dual yet this year. Denver was a little banged up at The Battle of Waterloo and never made it to Lisbon. They were both at the Tripoli Invite though. At that tournament there were five times wrestlers from both teams met. Two of those matches will likely be blow outs again (120 & 285), but the other three matches will likely decide the dual (132, 152, 170). Denver won two of those three swings matches last time. What could potentially be different from the last time these two met in the beginning of December when Denver won by 13? For starters, both teams have upgraded at a couple of different weights. Don Bosco’s best line up should see a better wrestler at 113, 152, 170, and 220 than it did in that December meet. Denver won all of those matches by fall in the last meeting. Denver also got a boost at 113 when Jacob Moore finally made 113 pounds just after Christmas, and he only has one loss since. The two matches at 138 and 160 will also go a long ways in deciding this dual. Denver lost both of those matches in the last meeting by decision. Then throw in if we will see Blake Steege or not and this meet should come right down to the wire.